It’s been tough sledding for Virginia Tech football in 2018. That trend continued Saturday when Pittsburgh shellacked the Hokies 52-22 at Heinz Field. With the loss, Virginia Tech drops to 4-5 (3-3 ACC), and Pittsburgh goes to 6-5 (5-1). Pittsburgh jumped out to a 17-0 second quarter lead, led 31-7 at the half, and cruised to the win. 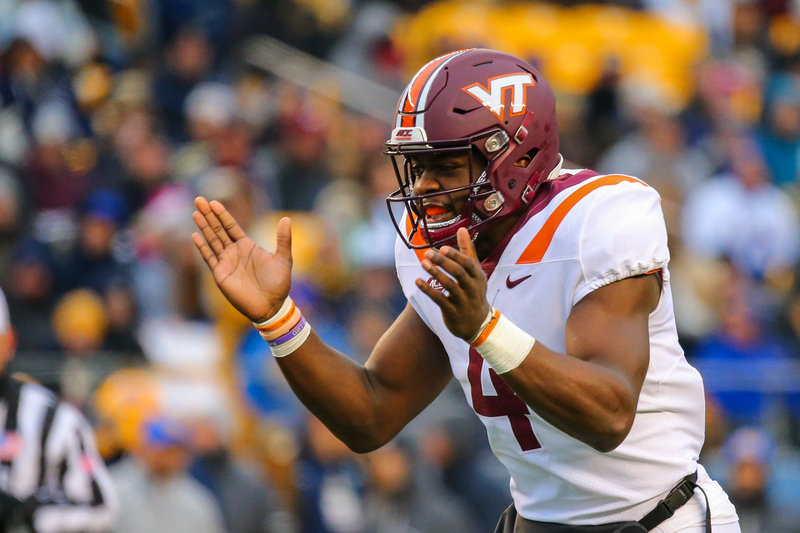 Virginia Tech has now lost three straight games for the first time since 2014, when the Hokies dropped contests to Pitt (21-16), Miami (30-6), and Boston College (33-31). 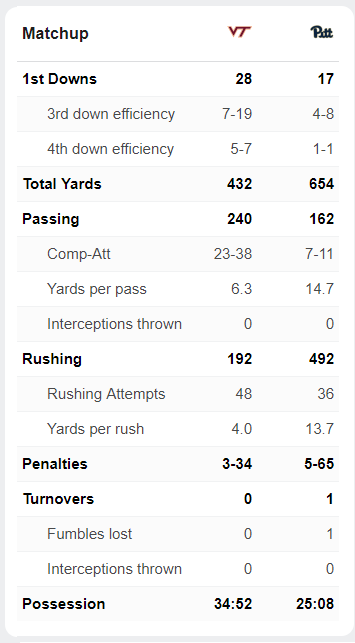 The Panthers gashed the Hokies for 654 total yards and 492 yards rushing. That’s the most yards that Pitt has ever garnered since the program began playing in 1890. It’s also the most yards that a Bud Foster-coached Virginia Tech defense has allowed, and the second most of all-time. The Hokies have now allowed 45 points or more four times this year. That last happened in 1950. On Pitt’s senior day, senior running back Qadree Ollison galloped through the Hokies defense to the tune of 235 yards on 16 carries and three touchdowns. Darrin Hall, another senior, wasn’t far behind, picking up 186 yards on seven rushes and one touchdown. Ollison and Hall combined for 18.3 yards per carry. The duo also ripped off four runs of 50+ yards. Perhaps no play better encapsulated the night for Virginia Tech’s defense than when Ollison found an open lane, stiff-armed Caleb Farley to the ground, and flipped his way into the end zone for a 97-yard touchdown one play after the Tech offense failed to convert on a fourth-and-goal. That was Pittsburgh’s final score in the rout. It was the icing on the cake for the Panthers, who now just have to defeat either Wake Forest or Miami in their final two games to clinch the ACC Coastal. Meanwhile, Virginia Tech is officially eliminated from ACC Coastal consideration. The Hokies were forced to use a depleted lineup on defense the entire game. Defensive end Emmanuel Belmar did not dress, defensive tackle Jarrod Hewitt did not play, and defensive end Houshun Gaines exited the game in the first half and did not return. Linebackers Rayshard Ashby and Dylan Rivers didn’t start for the second straight week, though Ashby did enter the game later. Cornerback Bryce Watts was out with a fractured forearm. While the defense had its issues, Virginia Tech’s offense did not fare much better. 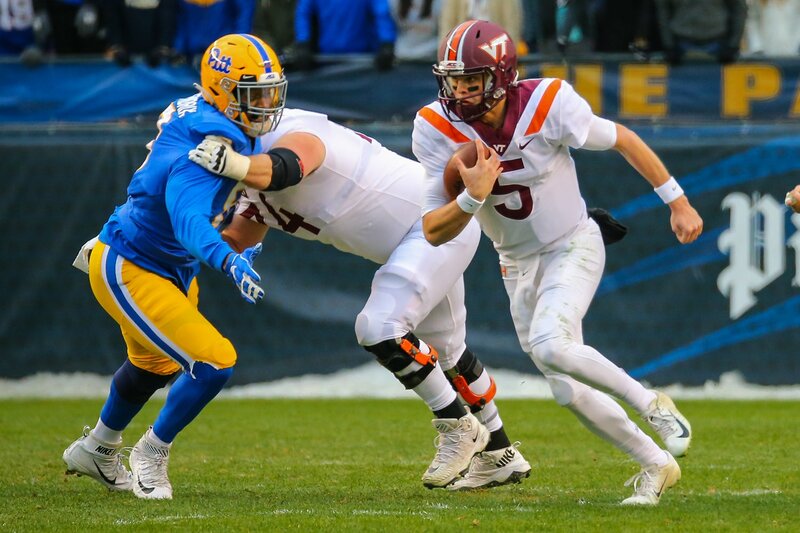 The Hokies were able to garner a respectable 432 yards of offense, but still only put up 22 points against a Pitt defense that has previously allowed point totals of 51, 45 (twice), 38, and 37. Whether execution or play-calling, Virginia Tech would be hard-pressed to win any games this year putting up just 22 points. Ryan Willis finished 22-of-34 for 231 yards and three touchdowns. He was also the Hokies’ leading rushing with 65 yards on 16 carries. Eric Kumah corralled two touchdown catches, and Damon Hazelton also added one, his eighth in nine games. Quincy Patterson played in his third game for Virginia Tech. The freshman can only play in one more game to retain his redshirt status. 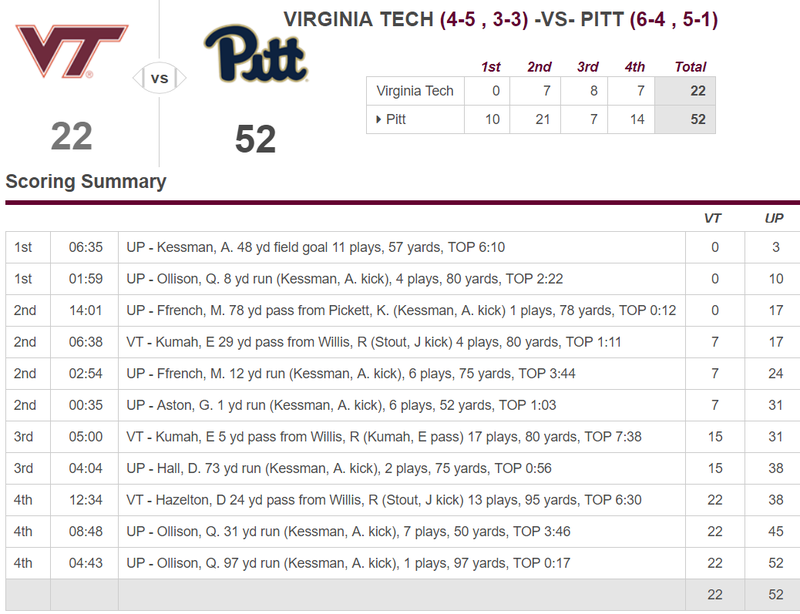 The Hokies inserted Patterson in the middle of several drives, but Pitt’s defense knew to expect the ground-heavy looks in those situations. He carried the ball five times for just four yards and was 1-of-4 passing for nine yards on mainly screen passes. Virginia Tech closes the season with two games at home against Miami and Virginia. The 25-year bowl streak is in serious jeopardy as the Hokies will need to win both of those games. Virginia Tech has not beaten an FBS opponent at Lane Stadium this year. The Hokies still have the option of scheduling a 12th game on December 1 now that a date with Clemson (or Boston College) in the ACC Championship is out of the question. Virginia Tech might need that game in order to extend the bowl streak. Bud Foster reported after the game that he fears Houshun Gaines suffered a torn ACL. If true, Gaines will be done for the year. Dax Hollifield notched his first career sack in the game. Pitt has now won seven of the last 10 games against Virginia Tech, dating back to a 38-7 Panther win in 2001. Damon Hazelton’s eight touchdowns ties Ricky Hall (1998) for the most by a first-year player in program history. The bowl streak? Who cares, it’s just a neato little stat. Concentrate on UVA and the Commonwealth Cup. We’ve been here before (1987-1992 for instance). A young team with new coaches requires patience and support. Losing patience and withholding support is an organizational death spiral. We Hokies have always prided ourselves on consistency of support, and not following other colleges as they fire coaches willy-nilly. Hang in there! Absolutely. We need more adults like you in the room. When is Cornelson going to be held to account? I recognize all the adversity that the D is facing with attrition and Bud’s been pretty forthright in the post game interviews so I appreciate that. But the O is supposed to be better than last season, aside from losing Jackson, and all I hear is crickets from the O coordinator. What say you, Brad? How can this team consistently fail to score even 30 points in a game? I don’t understand. Great Great point. 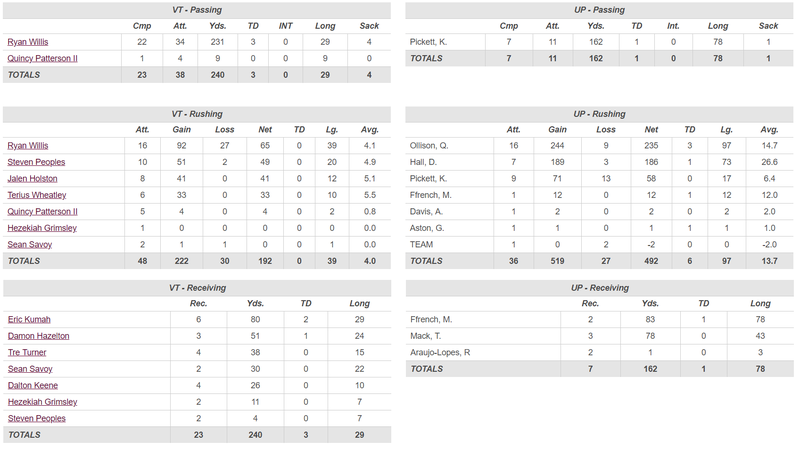 This is not all on Bud, youth, injuries, and replacing 1st string QB. The run game, the offensive schemes, tightend use, etc do not appear to have changed or improved for the better. If anything, the Josh Jackson injury appears to have let the OC off the hook and away from scrutiny and spotlight of explaining why there is no improvement with the offense and running game despite returning qn experienced QB (whose the son of a Michigan coach ………cue the ESPN violins please….). I’m afraid the whole year of injuries, attrition, and the major blow to your 1st string QB will let this entire staff off the hook until they repeat it again next year with a healthy group. Then more people will all see and know if 2017 and 2018 as an anomaly or an unfortunate downward trend. This is depressing. Looks like we can kiss both the bowl run and Commonwealth Cup goodbye. I really hope (and believe) that the ship can be righted, but we need an off season rebuild to get it done. I really hope we do not play the 12th game, this season needs to get over. Egad, we seem to have a Coach Fooeyendit. Quickly. It’s not going to get better. Stop the run and let our super db crew from db university deal with them. Arghh. I well recall the AD, ca 1987, calling Beamer in and telling him it was time to trash his buddies and start winning – or else. Ah well, we had some odd 25 years of goreat foozball. Foster hasn’t forgot how to coach or wanting to stop the run first and foremost. That being said, we are playing many 2nd and 3rd string players. Minus Alabama and maybe one or two other teams, how many teams could be be great defenses playing guys who should be on the bench or playing in spots instead of the whole game? I started at Tech during the 93 season and first of the bowl streak. I only know Bowl games each year. Not over yet but gonna be tough. Also with the defense struggling, it hurts the offense and causes the offensive coaches to gamble more and getting away from the run when it is working (I’m saying the run game have had good moments). We have been blessed for years to not have a huge rash of injuries but this year injuries has been killer. Bad luck too. I wish we could switch weeks for the BC and Pitt games. No Brown would have helped against BC. Time line is all wrong: it was 1992 (2-8-1), not 1987. The 1992 roster featured a lot of very young players who rebounded in 1993 to post a 9-3 record and begin the current bowl streak. We lost a lot of close games in 1992, many in the late stages. Granted, this year is different because of the blowouts but consider, BC and Pitt are Senior-heavy. BC’s OL featured 5th year grad students and Pitt boasts 19 Seniors. We’ve been playing against those teams w/players who are barely or just removed from HS: total mismatches. Beamer’s investment in young players in 1992 paid off immediately the next year. I’m less concerned though w/the losses than I am w/the continuity of leadership going forward. The current Sr. class has proven to be weak. We were told this year was coming and here it is. Live with it. We were, and it is..We have no choice but to deal with it.. Still, If you told me you (or ANYBODY) thought it would be nearly THIS bad I’d have to call BS on that! Like others it was clear from the beginning of this season that VT was in deep trouble. No, it is a talent/experience/depth issue. Hard to believe that any TSL reader hasn’t picked up on that from the excellent articles. I believe there are circumstances that came together to create the “perfect storm”. The offense is mediocre, but we lost our starting QB. The defense lost three starters early to the NFL. Lost three starters to suspension. Lost some to graduation. Injuries to other starters. Bad, bad, bad situation. However, I do wonder if we’ve really recruited well. Not sure I buy that the state of Virginia doesn’t have adequate high school players, so lets recruit NC, SC, GA, MD, DC, FL instead. There sure seems to be a lot of players from Virginia starting for other ACC schools. “There does seem to be a lot of other players from Virginia starting for other” schools. If they had the grades, then why? What are we doing or not doing besides losing games big on the national stage? Where did the stats in the 2/3 paragraph come from? Don’t we play Miami next week? Wasn’t GT the first of the three in a row losses? Scores don’t look correct. Am I missing something? Excuse me, they were the 2014 results. Time to get some coffee! I hate rehashing it but like I said in the comments section of Nathan’s reporting article after the September 22nd ODU loss…… I knew the HOKIES didn’t pass the eye test. I knew we had witnessed signs that more misery was soon to come. In the 28 plus years I’ve been a Hokie fan and then Hokie graduate in 97…. I’ve never seen my team this bad except the 2-8 record in 1992 my Freshmen year. After that, I was part of the inaugural student class that witness and cheered the Hokies out of the ashes and out of the football basement of the BIG EAST. My class introduced the Tunnel jump, the Sandman, the Key play and the Stick it in Chant to world. The Independence bowl was the exclamation and genesis of what has now become years of great traditions. Now the Bowl streak and the Virginia win streak is incredibly about to fall after 26 years of hard work by the Hokie Nation. If this thing comes crashing down…Fuente and his crew will forever wear that Jersey in my mind. He’s as dead as Seth Greenberg was after missing twice on Seth and Steph Curry brothers by disrespecting them with Grey shirt offers despite knowing his dad and mom were Hokies and Hall of Fame amateur and professional players. If Fuente fails to get this team to a bowl and keep the Commonwealth Cup win streak alive…..its a wrap….its a death sentence! I don’t know about those other things, but your class did not start the “key play”. My first game as a student was in Fall of 1984 and they were doing the keys out on 3rd down then, so it’s at least as old as 1983 (probably much older). So you want to fire Fuente after 1 bad season in his 3rd year in the program? That doesn’t seem like the Hokie way. Heck, Beamer was 2-8-1 after his 6th season. We have got to give Fuente some time…at least 5 seasons. I loathe the key play by the way…it’s weak. Worst Defense that I have seen at VT. Ever……..
under a supposedly offensive genius, our offense is no better than the final years of coach beamer. good bye bowl streak!! good bye uva streak!! It is hard to go up against a o-line that has 4 seniors with your normal defense that has been together all season, but with guys that are freshmen and redshirt freshmen that are starting for the first time. Sometimes it is just what you have left in the bag to put out on the field. The only positive out of this is the experience they are getting this early in their carriers. I do not know how we will do against Miami, but I am sure we will give Virginia a game. One good thing is that I did not see any quit in the players as some teams or players could do, as other teams have done in the past, not talking about va tech teams, but teams like Miami a few year ago. I wish I could go to the last two game to cheer the players on but living in alabama and getting off at 11:00 pm, at 57 the body will not do what the mind wants to do, so I will cheer from in front of the tv. Think it is time to look at the head coach he has been at tech 3 years now and every year the wins has gone down. Now tech has to win the last 2 games to keep the 25 year bowl streak going which is not going to happen. Ridiculous. Our problem is not coaching. What do you think our problem is? Is it really youth? Do you really believe THESE players will really be better next year? I see no potential right now…..sorry. There are Only a few have bright spots I see on the offense and defense. What was Fuente doing all this offseasons? Injuries aside how did the coaching staff pick THESE players go go to battle with? They just don’t look the part. Other teams appear not to struggle with strengthening their recruiting hauls…..BC, PITT, Wake, GT, Virginia etc. Yep every year we are missing out on key recruits WE REALLY NEED. Most teams are able to see potential in their youth and suggest that in time this young team is going to be really good or these Running backs are going to be really good or look at these defensive or offensive players playing above their years right now. Except for the new receivers, Quincy Patterson, Dax and maybe Floyd and Diablo…..I listen, read, and look around and I hear NONE OF THAT for the rest of the Offensive and Defense. The next man up concept is only good when as a coach you’ve done your part to coach all kids up so their Is NO drop off….otherwise it’s Coach BS talk. I hear you say looking at coaches is ridiculous…… So What do you think our problem is? You are off your rocker – we have a lot of talent – it is YOUNG – but not dumb. RELAX. Last year we had four or five “chunk plays”, this year that is ALL we have. When you dismiss 75% of your starting seniors on defense and have tons of injuries, what else would you expect. My biggest concern is our poor offense. After three years and new coaching, I expected a much better performance. Scheduling a 12th game for 2000 fans in December???? True Hokies will be there, if a game is scheduled. I will be there!! By Thur we will have had a great week of practice, corrected our mistakes, got back to the basics, etc. etc. etc…. Scheduling a 12th game only means we go 4-8 instead of 4-7. Before they are properly seasoned. It’s the freaking 9th game. I believe he’s referring to all the newbies that came in for Belmar, Rivers, Hewitt, Ashby, Watts and then Gaines. At least that’s how I read. The defense has no chance. It takes a lot more than 9 games to adjust from high school to college. The main problem is the lack of senior leaders on this team, which were all recruited before CJF. Because our poor recruiting in those years we took players with off field issues which has led to them eventually being dismissed. The lack of on field leadership has led to the inconsistency such as we saw yesterday – lots of tackles for loss, and lots of chunk plays. I am not giving up on CJF or the Hokies and think the can still win the next two games as they are much better match-ups for us. Go Hokies.